Who Took a Bite off the Moon? The other night somebody took a bite off the moon, and left it all bloodied and red. According to the Mayas it was a jaguar with its powerful jaws. Seven demons attacking the king, thought the ancient people living in Mesopotamia. Unruly "pets" (lions and snakes) biting their master, the Hupa believed. A sow in ancient Egypt, a three legged toad or a dragon in China, all busy swallowing the moon. 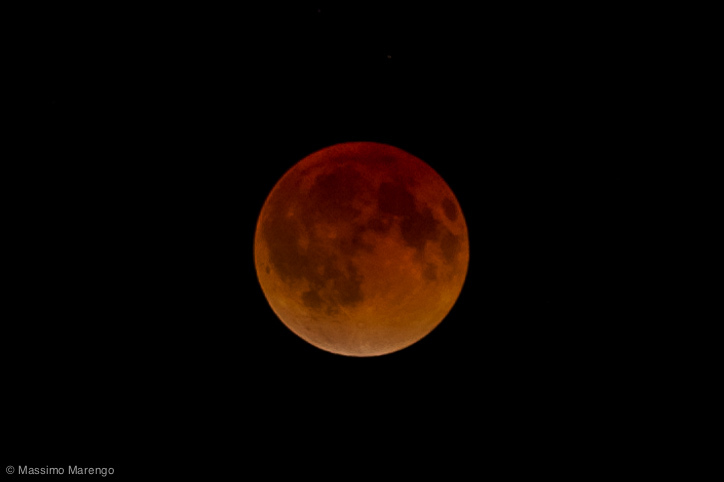 Initially I thought I could just write a post about the intense copper color the moon was sporting during totality, but a short search on google will give you the answer anyway. It is quite simple, in fact: from the surface of the moon during total eclipse, if you look up in the sky you will see Earth's night side, circled by a thin ring of fire as Earth's atmospheres is scattering the light of the Sun behind, the color of sunset. The red color of the "blood moon" is the sum of the light from all sunsets on Earth! Lunar eclipse are in fact common, and can be predicted quite easily. The ancient Mesopotamians knew enough astronomy to calculate eclipse occurrences with enough advanced time for installing an impersonator for the king, to be attacked by the sky demons. All while the real ruler would lie low hidden amid the populace, waiting for the danger to pass. Columbus himself, it is said to have taken advantage of accurate lunar eclipse predictions to trick Jamaican natives in feeding him and his crew while his ships were being repaired. He just told the natives that his God would show his anger during the night the eclipse was to happen, and obtained new provisions by promising to free the moon on their behalf. If you want to try the same trick with your neighbor, your next chance is on October 8 next fall. It will be visible again from North America, the Pacific, Australia and east Asia. Totality will start at 10:25 UTC (Greenwich time), which is at 5:25AM where I live: kind of early for me... I will probably pass. It will be more convenient in Japan, where it will happen just after sunset, with the red moon rising to the east. Dear japanese friends, six months from now I will be looking forward to admire your photos of the blood moon next to Mount Fuji illuminated by the latest rays of the sunset! 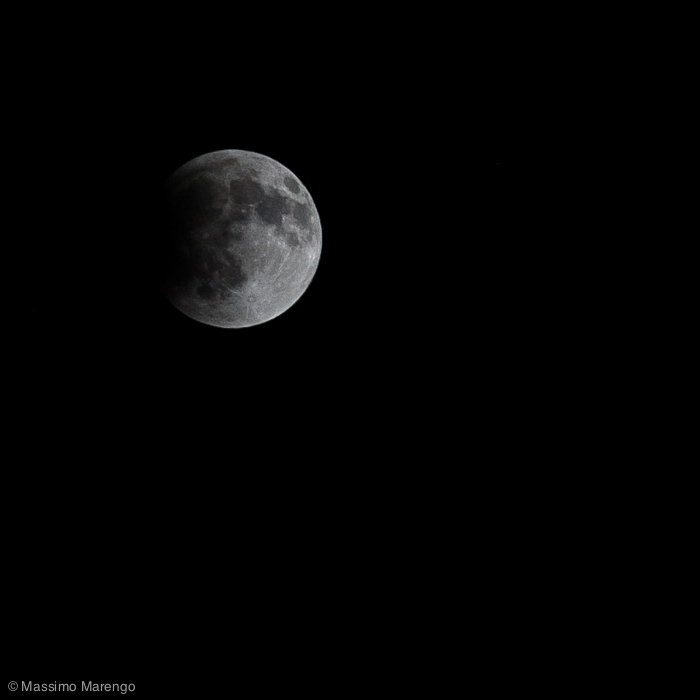 The last photo below shows a wider view with the moon and some assorted companions. The bright star below is Spica, which is a binary system with two massive blue stars that are close enough to deform their shape due to their mutual gravitational attraction. The very luminous spot in the top right corner is instead Mars, which is currently at its closest to Earth, and as such particularly bright. And red too. For the last few months this blog has been roaming all around the world, with posts and stories inspired by mountaintops and valleys in four different continents. It is time to get back home; in the freezer, that is. 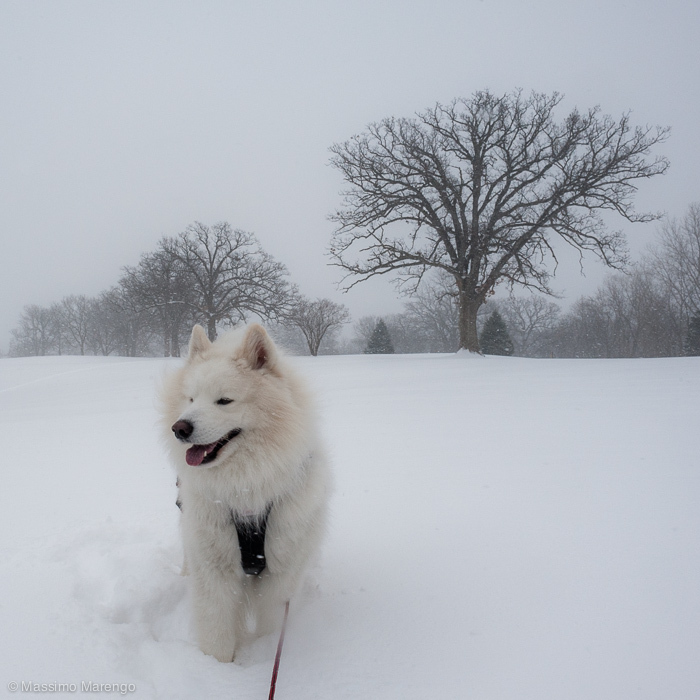 Kero and I had our fun with the frigid winds and powdery snows but one would have thought that by now, April, winter would have let its grip go off the flat plains of Iowa. Not so, we still had a sprinkle of fresh snow on Friday morning. Not as much as in the photo above, but enough to cover with a layer of frost the dead flattened grass waiting for warmer times. It still go below freezing at night. This made me think about a story I heard on radiolab, about snow and the cleverness of life. It goes like this. 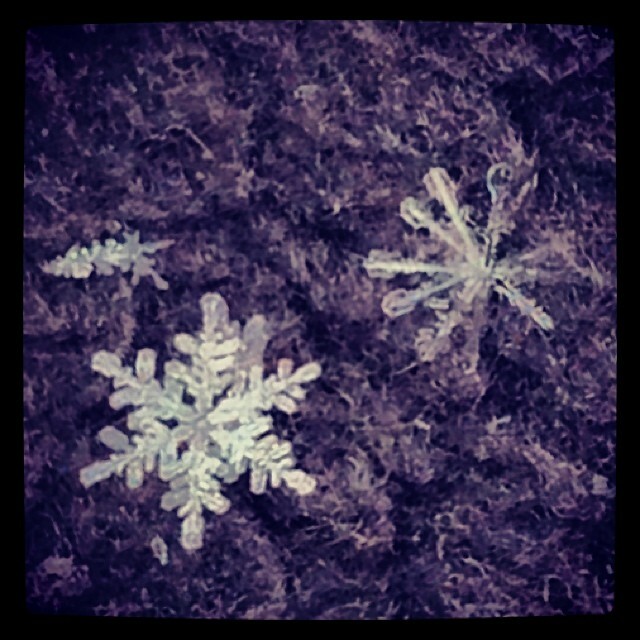 Snow is made of ice crystals, like the ones in the photo on the left, borrowed from my instagrams. Ice in turn is made of water, cooled below its freezing point. The conversion of water into snow happens in the clouds which are made by floating tiny droplets of water vapor. You want to make snow? Simple, take some of this water flying in the sky, freeze it below 0ºC and voila, snow-on-demand. Well, nature is not so simple, after all. The tricky part is that, to make ice, water is not enough. You need a nucleation point around which the molecules of ice will start to self-organize in the ordered state of solid ice, from the disordered chaotic anarchy of liquid. Without a nucleation point, in fact, water can be cooled well below zero without freezing: supercooled water, like the one I mentioned a few posts ago in reference to cosmic inflation. Ice that won't freeze without a nucleating agent turns out to be a problem, however, if you want to form snow from the pure water in the clouds. Many sorts of substances can work out as nucleating agents. The best one is ice itself: add a little crystal of ice to supercooled water or vapor, and the little H2O molecules will stop dancing in the wind, to stick just in the right place, growing the crystal like a beautifully sculptured snowflake puzzle. But what if you don't have ice to start with? Well, there are a number of chemicals that mimic the shape of ice crystals, and act as surrogate ice-nucleating points. One of them is a protein secreted by bacteria that like to live on grass. These bacteria are very common, and are found about everywhere in the world. One of their role is to help forming the frost that covers the grass in cold autumn nights, an ice-jacket that protects it from nocturnal below-freezing temperatures. Bacteria are tiny bugs, however, and it doesn't take much to blow them away. In fact, bacteria likes to be blown away, to be carried by the wind in search of greener pastures. Some bacteria are so light that they can be blown all the way up to the sky: the jet stream is their preferred global transportation system. And that of course presents a problem: the sky is not very conducive to bacterial life, and at some point any good bacterium will need at some point to find a way back to the ground. Bacteria, however, do not have parachutes: how to get safely back to Earth from the heights of sky? That's where the ice nucleating protein comes handy. Each bacteria in the sky, when the temperature is cold enough, will start nucleating ice around its shell, ultimately growing a large snowflake, heavy enough to precipitate to the ground, but light enough to slow down the fall. Think of this, next time its snowing: for each snowflake falling to the ground, there is a tiny bacterium finding its way home.